THE HAUNTED SCREEN is a film essay about one of Germany's greatest contribution to international film history: the films of the 1920s. It is a collage composed of original footage from the famous movies of that epoch, which have never been this fully documented before. 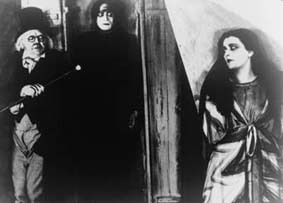 With clips from NOSFERATU, METROPOLIS, DAS CABINETT DES DR. CALIGARI, DR. MABUSE, DIE NIBELUNGEN, and FAUST. Peter Buchka was film editor of the Sueddeutsche Zeitung for 25 years, publishing his monograph on Wim Wenders, entitled Augen kann man nicht kaufen, in 1983, as well as a collection of director portraits in Ansichten des Jahrhunderts. Between 1985-1996, Buchka produced ten hour-long television portraits of New German Cinema directors, limiting himself in these portraits to montages of statements and film clips. Peter Buchka died during summer 1998.